Two days ago Xiaomi teased the arrival of its new sub-brand POCO to India and now the company is teasing the Pocophone F1 itself. As mentioned before, it's believed to be the cheapest Snapdragon 845-powered phone on the market and recent teasers come to confirm that, focusing on its performance. 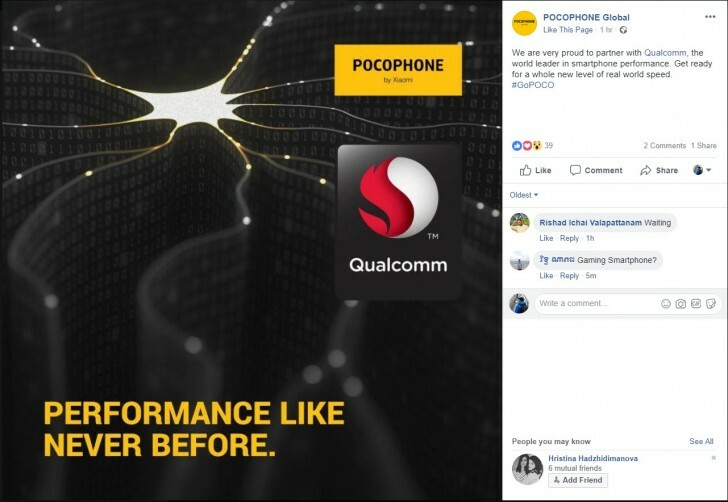 Meanwhile, a POCOPHONE Global Facebook page has gone live and started teasing the smartphone with Qualcomm chip. It's probably safe to assume if the company is always bragging about "performance like never before," a Snapdragon 845 SoC will be in charge. Besides, one of the recent leaks gave us even more proof. And it doesn't stop there. It's no secret that the Pocophone F1 will be available in Europe and India and the most recent report reveals the storage and color variants. With all those leaks coming in, the launch could be approaching fast. very good move xiaomi! i never buy flagships, no need all this glass and metal. I'd prefer have plastic simple phone but with good internals. This is not their flagship device, Mi 8-series is their flagship-line.